(Daily file photo by Katie Pach) Mayoral candidate Jeff Smith attends an electoral board hearing on Monday. The board voted on Wednesday to overrule Smith’s objections to the nominating petitions of the four other candidates. 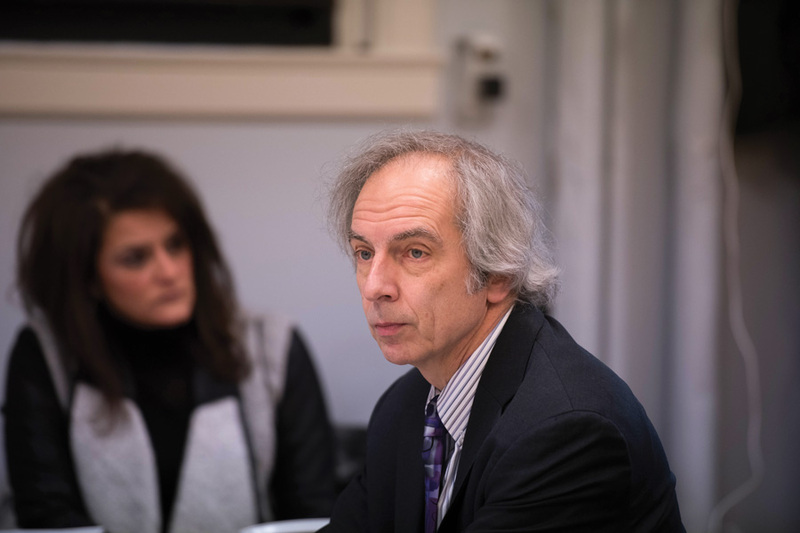 The Evanston electoral board threw out objections filed by mayoral candidate Jeff Smith to the nominating petitions of four of his competitors. The decision came two days after the board first met to hear Smith’s objections and ensures the mayoral primary scheduled for Feb. 28. It was the second decision the board has issued in this election season. In late December, the board overruled objections made by a supporter of candidate Ald. Brian Miller (9th). Objections made by the same supporter, William Arndt, against Ald. Mark Tendam (6th) were withdrawn before the hearing. Confusion has surrounded the mayoral election since Miller filed his petitions in November, which was early than city officials had specified. At the time, the city clerk’s office had declared the proper filing dates to be in December. However, Miller filed weeks earlier, citing a 1992 Evanston referendum that said a primary must be held in a mayoral election if there are more than two candidates. Tendam, businessman Steve Hagerty, and former Evanston Township supervisor Gary Gaspard rushed to file soon after. Smith filed in December after City Clerk Rodney Greene announced the city would keep two filing dates. Greene announced after Smith’s filing that the city would hold a primary for the election based on state law, which requires a primary for races with four or more candidates. Smith disputed that Miller and Tendam had filed without indicating a party and had not made clear the election date on their petitions. As for Gaspard, Smith alleged he had filed for an election that did not exist, and he held Hagerty had filed for the wrong election. “None of these issues rise to a level serious enough to deny ballot access to the candidates,” said Mayor Elizabeth Tisdahl, who sits on the board with Greene and Ald. Ann Rainey (8th). The board’s decision was unanimous, but Tisdahl requested the city’s law department work with the city clerk to clarify issues raised concerning the primary and the referendum. “No candidate should be a lawyer or hire a lawyer to run for public office in the city of Evanston,” she said. Although she agreed with Tisdahl’s statements, Rainey said the situation was legally confusing. Rainey also said Smith should have to be in the primary. Smith was the only candidate to file as an independent. Rainey said she would act “much differently” should similar issues come up in the future. Both Greene and Rainey said the campaign season was among the worst they had seen during their years in Evanston. Greene said the decision was something they would have to revisit to prevent future confusion. Smith expressed displeasure with the board’s singular decision during the hearing, saying his four different objections should have required separate decisions. Smith told The Daily that while the board’s decision was “understandable,” he did not come into the hearing expecting to lose. Although he has not decided whether to bring the issue to court, Smith said he felt he would have a strong case.